The unique cocktail of slenderizing and restructuring agents is specially formulated to provide focus attention to areas with sagginess and slackened skin. Especially for tummy, arms, thighs and hips. • This innovative formulation with high content of Bio-Technological ingredients is proven to restructure the skin with a strong tensor effect, leading to a tightened skin and reshaped body. • Natural Phyto Extracts (Fucus, Silver Birch, Centella Asiatica and Ginkgo Biloba) actively eliminate waste, and improve the appearance of orange peel. • MFA complex (lactic, citrus and malic acids, and green tea extracts) gently reinforces skin renewal, reassuring a smooth, supple and firm skin texture. 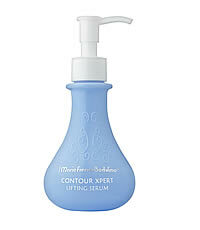 Apply a sufficient amount of Contour Xpert Lifting Serum on the desired areas and massage in circular movements and upwards directions till the serum is fully absorbed.